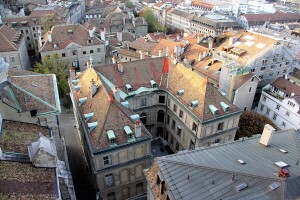 For a city of less than 200,000 inhabitants (but the population of the canton as a whole is roughly double that figure), Geneva undoubtedly has much to offer in terms of culture: it has over thirty museums, several concert halls (including the Victoria Hall, the Grand-Théâtre and the Bâtiment des Forces Motrices), over twenty theatres, about thirty cinemas and more than a hundred private art galleries. Various cultural manifestations take place throughout the year in the form of festivals, shows or other artistic performances - a recent and much appreciated addition being the annual Music Festival in June. Although some people here have criticised our authorities as having cultural tastes or priorities that are too highbrow, being obsessed by Geneva's image or prestige on the international scene and with emphasis being laid on high-profile musical institutions such as the Victoria Hall, the Grand-Théâtre or the Bâtiment des Forces Motrices, other cultural centres (such as the Usine, the Maison des Arts du Grütli, the Forum de Meyrin, Saint-Gervais, the Centre d'art en liIle, the Cité Bleue and the MAMCO) bear witness to our city's efforts to promote a thriving contemporary arts scene. Despite being seldom regarded as such, our public libraries are an integral part of the canton's cultural life. Temporary exhibitions, literary readings, small-scale concerts and sometimes theatrical performances are held in most branches. Coupled with their twin sisters, the two music libraries, they also constitute one of the best places to gather information (leaflets or fliers) on what is happening in Geneva, culturally speaking.